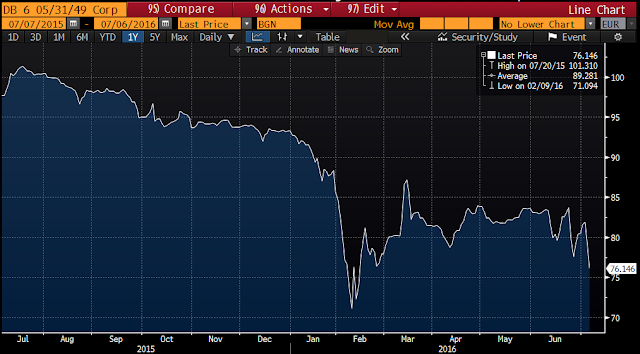 The good news: Bank Monte dei Paschi rallied 6% yesterday! The bad news: It was only a 1.6 cent rebound. The ugly news: DB keeps dropping like a stone (another 4.4% yesterday), and its Cocos are starting to get shellacked again. 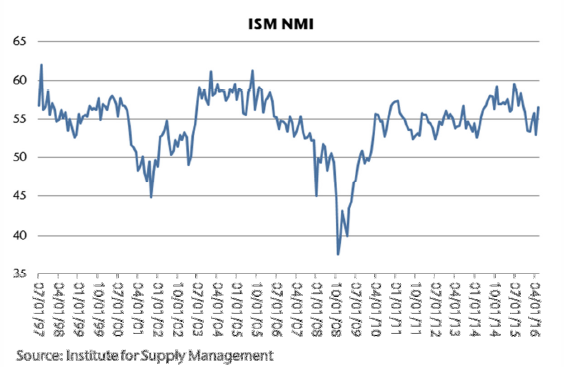 The good news: The services ISM delivered its strongest reading since last November, printing 56.5. Coming on the heels of a stronger than expected ISM report, perhaps the US economy is kicking down the wall of worry? 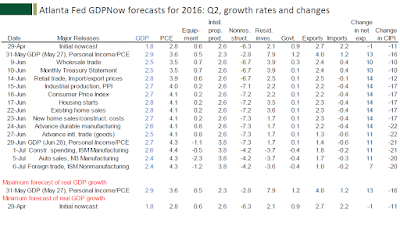 The bad news: The GDPNow forecast for Q2 isn't looking as strong as it was, with growth now tracking at 2.4%, down from 2.8% the day before the Brexit vote. Much of the downgrade appears to be a function of weaker residential investment, which may seem odd given the housing-boosting effects of lower rates. Speaking purely anecdotally, however, in Macro Man's own little corner of La-La Land something like 5% of the entire housing stock is currently for sale, representing 13 months of supply. Now, this says more about the finance industry than it does about US housing generally, but either way it's a little eye-watering. The ugly: The initial read on Macro Man's payroll number does not look good, with a current forecast of just 85k. Adjusting for the Verizon employees going back to work, that still only puts us as 120k, well below consensus. Such an outcome, were it to materialize, could easily get the Fed doves to push the "Achtung!" button yet again- lord knows it's had a regular workout recently. In the comments section yesterday, a reader asked Macro Man to share his thoughts on the significance of Friday's number. Frankly, Macro Man isn't sure that it's that significant at all. With the spectre of Brexit uncertainty set to loom for the next several months, it's difficult to credit that the policymakers depicted in yesterday's minutes would countenance tightening any time soon. After all, anyone who takes TIPS breakevens at anything remotely approaching face value either doesn't understand what they're doing or has an overtly dovish agenda; Macro Man will leave it to the reader to decide which of those applies in this case. He had to laugh when he saw that some FOMC members had already started moaning about the possible hit of higher energy prices on consumer spending; no doubt this was the same crew that moaned about the impact of low energy prices on resource employment and investment a few months ago. While stocks once again took the dovish Fed to heart, at this juncture you'd have to think that just about all of the juice has been squeezed out of of the "easy Fed" trade. Amazingly, there is just 5 bps of tightening priced in for the FOMC over the next twelve months; at the beginning of the year, there were 58 bps priced for the equivalent period. Now, with only a 20% chance of one hike over the next year in the price, you can of course make an argument that a super-strong number will have an outsized effect; after all, with so little priced into the market, the balance of risk is tilted firmly in one direction. This is all true. In fact, Macro Man saw a remarkable statistic yesterday; since the March FOMC announcement, fully 49% of the daily cash closes in the SPX have been between 2070 and 2110 (less than 2% apart.) Yep, it's been a difficult road to travel while being an SPX bear. A safer alternative might be to watch for bearish action from afar; the screen below might be a good place to start looking. July 7, 2016 at 8:59 AM × This comment has been removed by a blog administrator. Anon- I'd posit that the only way European equities could rally to their highs of early last year would beif the ECB were to announce they are adding equities/ETF's to its portfolio. But then, Japan. One thing that your blinkered view should observe is, central banks have caused all of the crashes due to their policies or lack there of. Why would it be any different this time? The thesis that they will make a balls of things seems pretty strong based oncurrent actions and reactions. The Zerohedge-esque tone in comments section really is rather tiresome. anon 9:32 - Tiresome, maybe, but true. Wake up - look at the facts. ..."He had to laugh when he saw that some FOMC members had already started moaning about the possible hit of higher energy prices on consumer spending; no doubt this was the same crew that moaned about the impact of low energy prices on resource employment and investment a few months ago." The spike in oil yesterday on API data release, made me laugh also. As much as I love macro, it seems "crystal clear" that most in the markets are trading micro and who could blame them? As eluded to in "the five bricks" there is fear creeping in, and also bravado. I find it hard to say either is wrong, the macro's are well hedged, while the micro's are landing clean harmless jabs, but both making money. On that, I don't believe today's EIA or tomorrows NFP billings will be anything more than than the equivalent to a one night stand... Already forgot about when getting in the taxi. Still, it is good fun at the time. Isn't it all about confidence? The issue with Central Banks tinkering is that it provides a "relentless" bid to equities, irrelevant of fundamentals nor technicals. The events unfolding within those UK real estate funds might spark questions on the actual liquidity illusion in other area, such as credit and could trigger unmanageable outflows which would thus destroy confidence! 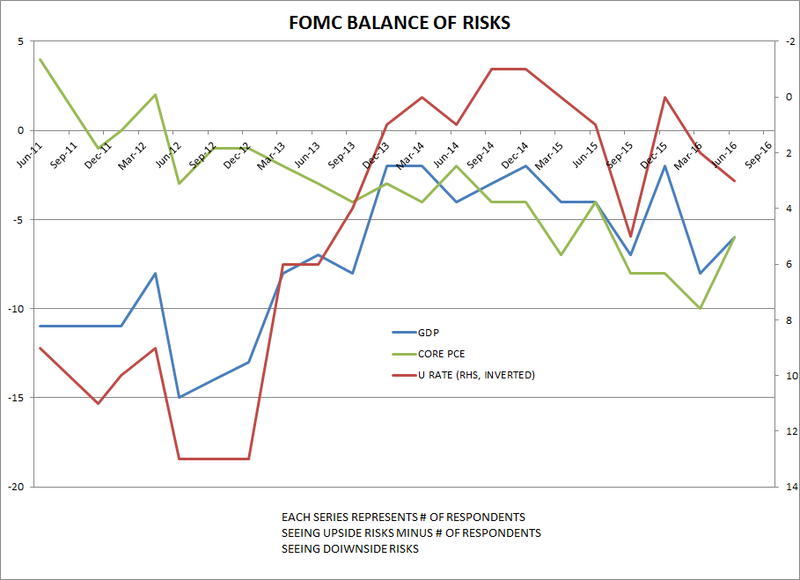 Risk is riskier and no one is less aware of it than regulators or CBs! It seems to me that most of the crowd in the comment section are macro/top-down people who usually do not look beneath what is going the index level in equity markets. The landslide in yields does impact equities in a MASSIVE way. The relative performance and valuation of stocks that are labeled as defensive, high quality and non-cyclical is extreme by any historic standard. Basically there are two different equity markets. The stuff I mentioned is in the biggest bull-market since the sixties and everything else ranges from boring to insanely cheap. Just today Danone bought Whitewave with 100% debt financing on something like 20+ EV/Ebitda and the market loves it. The S&P Looks flat but utilities and telcos are up 25% ytd. The same theme applies in all regions! In a sense falling yields are pushing up the equity market, just very selectively so far.. Which is great if someone had money on it (maybe). At 30K feed though, at least to this observer sees everything is being debt financed thanks to cheap money. Here in the U.S., debt(s) of all types are at historic highs, only financials deleveraged for a brief period, but are on their way back up. My question would be then, when does the ROI of debt financing start having serious diminishing returns? Or, is there an area that it is already impacting? Asset prices have gone through the sky and into outer space, but here in the States, especially mine, incomes (real median) have been in decline for over 15 years! The Danone deal is financed 100% via debt right? The ECB is buying corporate bonds in the primary market ... consumer staples is one of the biggest sector in the main EZ non-financial corporate bond benchmark. Need I say anything else? This is not about tinfoil hats. We know for a FACT that the ECB either directly or indirectly will be financing this Danone deal. These markets are completely detached from reality. Wonderful, I agree, but detached all the same. Soros put 100 bucks to work on DB. Chances are he thinks that even if Brexit didn't happen, DB was in the shitter. People bandy about DB's 40x leverage but how important is it? Any bank analyst here willing to share whether we're going to have Lehman 2.0? @europeanbull those are some interesting thoughts - I have sort of lived both lives (macro/commodity and fundamental equity, or bottom up research although much more the former ) so I understand where you are coming from. My problem is that, while clearly valuation multiples would explode with low interest rates, the low rates themselves are suggestive of a static earnings environment in the absence of strong productivity growth - slower earnings growth also imposes, in and of itself, some constraints on multiple expansion by increasing the probability of one off events (if car sales were guaranteed to grow in perpetuity people wouldn't be calling the TSLA solarcity deal a ponzi scheme). There are times when ignoring macro and focusing on stock picking is absolutely fine, and perhaps even preferable. My experience has been that such environments are just a subset of tame macro conditions. To think that big currency moves or structural trends in productivity are not going to have an impact on your low P/E stock, or its dividends, can be a bit dangerous. That said, If you are one of those great believers in human ingenuity over a 100 year cycle and always do long only cash, then I guess thats that and you can ignore all of the above. Just understand thats a bet also, not a law of physics. Thanks for many good posts and thoughts MM. One quick on the ground note. I live in Dallas, and housing market is very hot (weather very hot also). What once was an inexpensive city has "inside the loop" become very expensive. One of largest apartment markets in US, and number of apartment units under construction at all time high. Note this statement in the above article: "So how does Quicken Loans get from 1% down from the buyer to the 3% necessary to take part in Freddie Mac’s program? Quicken grants the extra money to the borrower, Banfield said. “We require 1% from consumer and we give the consumer a 2% grant, so the client has 3% equity immediately,” Banfield told HousingWire." Weird feeling today that something out there is going to break very soon .... so look, the TLT chart is telling LB to have a cheeky punt on yields rising here, at least for a few days, and yet the situation with gated British property funds, and a glance at the charts for EU financials are telling him that shorting bonds here might be a very very silly idea indeed. The parallels between US 2007 and UK 2016 are simply too freaking obvious to ignore. LB, absolutely the last thing anyone should ever do is listen to my ideas about FX, but 'how can it not go higher?' sounds awfully 1999 tech stock message board, doesn't it? "EU Commission seeks sanctions on Spain, Portugal over deficits..."
This is great news for all. It's high time the EU started punishing these idle southern Mediterranean countries, inhabited by layabouts and ne'er-do-wells, by destroying their trade balances & fining them heavily, the funds of which can be sent to Germany. Next Italy and Greece should face sanctions and fines. After that, France. There will of course be opposition, but a conscript EU army can be fast-tracked and sent to occupy these countries, to coax them into submission. Hopefully the UK will see the error of its ways in leaving the EU, and vote for sanctions & fines on our industries while being occupied by German troops (for our own good). The Italian banking "crisis" should be a big nothing. Maybe a 40b issue, which Italy could address with its own balance sheet. If a Greek bailout could be agreed last year, then surely, when all is said and done, Europe will allow Italy to bailout its banks. Grandmas committing suicide because Germany forced a bail-in of her bank plays right into 5-star's hands, and everyone should know that. China FX reserves #s continue to improve. Even adjusting for the flow of RMB from onshore to offshore as GS does in its July 4 piece, the situation isn't looking bad. CNY is depreciating, but the latest "leaks" to Reuters have it at 6.70-6.80 by year-end, which is in-line with forwards. Nothing to do there. Meanwhile, Chinese rebar futures, iron ore, and other China-sensitive commodities have rallied way off their post-exchange restriction lows. The price says China bears are wrong, for now. Oil. In H2, this looks like it's be a bet on 1) the dollar, 2) the Niger Delta Avengers (Nigeria at 1.8 or 1.2mbpd? ), 3) Chinese SPR accumulation (nearly 1mbpd in H1). Assuming a steady dollar, continued Nigerian disruption, and China SPR and tin pots accumulating at H1 pace, then we could see 60s, maybe higher in H2, by my model. Buhari seems too obtuse to strike a quick, decisive deal with the NDA. Reports suggest Chinese tin pot demand is already down, and JPM did an interesting piece estimating the SPR's size versus its announced target, implying that accumulation should slow down sharply in H2. If I assume dollar flat, disruptions in Nigeria, but China slowing down accumulation, I don't see oil much above forwards. Also interesting to observe the curve has been steepening the past month. GBP. This thing is looking for a level, in the direction of the lower right hand of your screen. Stay short until price action says otherwise. US 10Y looks due for a bounce, on technicals. Got short yesterday. EM carry trade? China data doesn't signal imminent doom. Commodities may have bottomed. DM rates are super low and you couldn't ask for a more Dovish Fed. Many EMs have significantly rebalanced and inflation rates have or are topping out. I have some of these trades on. SPX. Shorting this thing, whilst we have no recession and NIRP/ZIRP fueling M&A and buybacks is a trade for the quick or the dead. The point I tried to make is a different one. I am not a bull on yield plays, quite the opposite! I am trying to say that the impact of low yields is already there and it is big!! Headline indices do not look like this, but underneath everthing that is remotely associated with yield is in a massive bull-market. It is extremely painful for people like me, who do not think 5,5% is a solid anchor for cost of equity. WTI down close to $45 today as the July sell-off we predicted appears to be upon us. The crude oil fan boys have gone remarkably quiet this week. Tuesday/Wednesday's dip buyers and Kevlar glove wearers are already bleeding profusely. I am taking my cash and getting out of the pool while I still can. In other news, my compatriots are just beginning to realize that Britain is in the middle of a right-wing coup. If you think Trump is nasty, you haven't met Theresa May, the likely new leader of The Nasty Party and the inheritor of the mantle of The Iron Lady. It won't be long before Canada is seeing a spike in citizenship applications from the UK as well as the US. Trump is a cartoon Nasty Guy and primarily a Media Creature with an aversion to the nutty parts of the Conservative agenda. May is the real thing. LB will find himself under an ASBO in no time for embracing such freedom of speech, something that is protected in the US by the First Amendment, but not in his homeland. I wonder how many of last week's voters (or indeed the complacent and lethargic David Cameron) now understand that UKIP was a Trojan Horse, the real purpose of which was not to restore to Albion the joys of cheap New Zealand lamb and butter, but to deliver power from wishy-washy centrists in both parties to the right wing of the Tory party, the true home and power base of "fruit cakes, nut jobs and closet racists". [ducks to avoid rotten tomatoes from the shires, and assorted fruitcakes and nut-jobs everywhere]. Tomorrow's US jobs number will be less interesting for itself (as it seems likely to be confined within the range from A Bit Weak to Another Goldilocks Number], and rather more interesting for the market and media reaction. Monday marks the start of another equity options expiration week, and could see the last short squeeze before the European banking crisis once again permeates the US consciousness. It's funny when they do stuff like that...keeping your money, that is. (…) If expectations for the second quarter prove true, US companies will post their fifth straight year-over-year profit decline for the period — the worst stretch since the aftermath of the financial crisis. With the season set to get into full swing next week, analysts are forecasting a decline of 5.4 per cent, according to FactSet. @EuropeanBull.. great thoughts. I agree and have been saying the same thing for months (though in US the growth vs value trade turned very noticeably in Feb (djtsmo stopped going down), even if utilities still hitting new highs). To me all these low vol/smart beta stuff is just an accident waiting for inflation. Once you get inflation, staples will experience margin pressure and banks will rally (with expected rate hikes). It the next big equity rotation trade, but could be a while. EU reits looking interesting. UL NA 4.4% yield. I'd be really curious to know what EU pension managers are doing to neutralize their liabilities now. Clearly not buying equities. 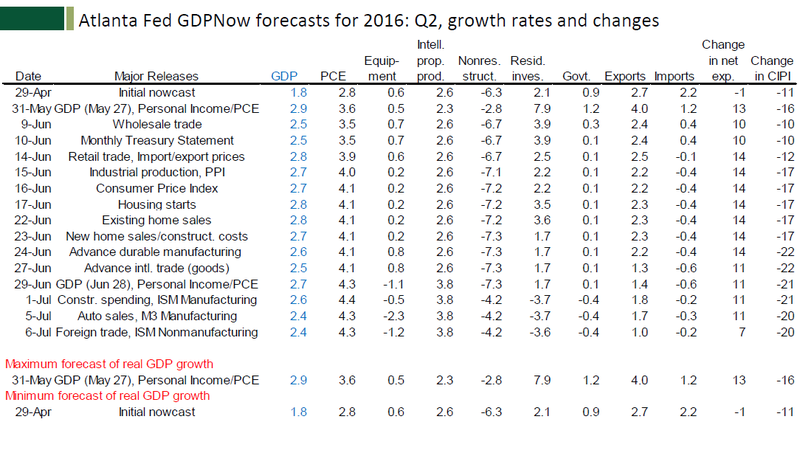 CAPE-based long-term performance forecast are presented here. @Anon 3:38AM - thanks for that link.